I needed a place to send people so I could explain what's going on here, and this was it. I was feeling like I had a lot of virtual balls in the air, like silicon sparklers being juggled in a holodeck in Second Life. 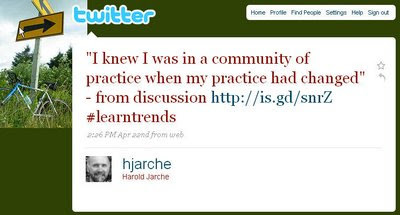 I agreed to participate in the LearnTrends conversation being sustained online for 24 hours April 21-22 by Jay Cross and friends. Jay is known for his Internet Time blog http://www.internettime.com/ and books/writings on social and informal learning. The event is based at the Corporate Learning Trends and Innovation Ning: http://learntrends.ning.com/page/april-2009-event or http://bit.ly/46G1Om. Jay said he wanted to feature webheads in this program so he gave us three hours, 1000 to 1300 GMT on April 22nd. Meanwhile adjustments and tweaks were being made impacting plans I was making for use of this time, but when I saw that happening I managed to lock down 10:30 GMT to 11:30 GMT on the schedule here: http://learntrends.ning.com/page/april-2009-event. 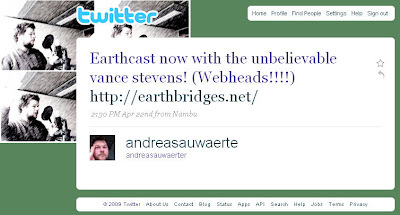 The times I selected coincided with a second 24 hour conversation about Earth Day, being celebrated by the webcasters at Earthbridges all day April 22nd and streamed out on http://earthbridges.net/live. 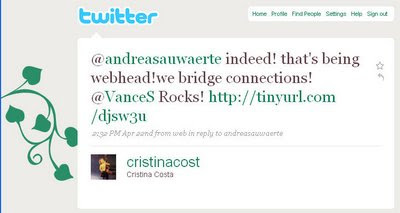 I managed to get Webheads down on the schedule here http://earthbridges.wikispaces.com/Earth+Day+2009 from 10:00 to noon GMT. Meanwhile a third element was put in juggling motion when I informed student groups at Petroleum Institute where I work, that they could join in as part of their own Earthday celebrations. So a conversation with students at the PI about our environment has become a recorded part of the LearnTrends event, and was streamed worldwide live, as it happened. By 10:00 GMT I will go to a classroom at PI where I will likely be all alone at first, and and I will log on to Elluminate at http://bit.ly/WPKGi. 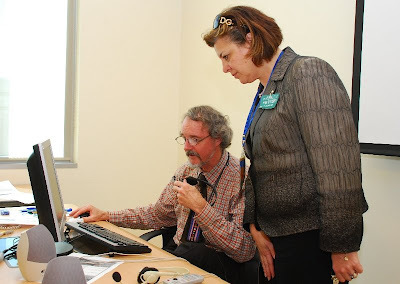 There is no Skype at PI so I will be in the Elluminate chat and voice room, and in the chat room at http://earthbridges.net/live. 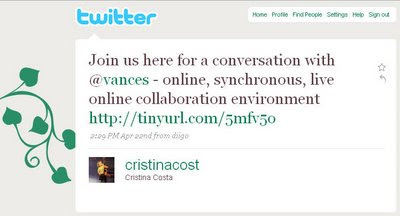 I will also be checking Twitter, which you can follow at http://twitter.com/vances. At 10:30 GMT, Sanja Bozinovic intends to bring 5 high school students (not sure from where in the world) to Elluminate. At around 11:00 GMT some students from the PI might appear. We'll continue the conversation and stream. Michael Coghlan has also promised to be in the area. I will continue as moderator of LearnTrends events until 13:00 GMT. I'll report how it came out here. However it comes out, it should be F.U.N. All are welcome.